How a company handles its online returns is one of the trickiest areas of ecommerce customer service. How helpful, flexible and clear you are about your returns process can mean the difference between encouraging repeat customers and sending them off to a competitor. There’s an excellent article on the best practice of handling returns written by editor-in-chef Graham Charlton which highlights 14 ways that companies can avoid annoying their customers. But what if you want to reduce the amount of returns your business deals with, particularly if you’re a fashion retailer that traditionally deals with a higher volume of returns than other businesses? Are there ways that you can help consumers find the right size product straight away, therefore saving you and the customer unnecessary trial and error? Let’s take a look at some examples, including some from our own case study database, to see how companies are reducing the amount of returns they receive. Retailers in the US report a return rate of between 20% and 40% for online sales, with poor fit cited as the number one reason. In addition, 72% of retailers cover the cost of delivery and/or return of items, a service which can prove expensive. …some customers treat our free shipping service as part of their changing room experience, except it’s at home in their bedroom. Now the fashion retailer has reduced fit-related returns by up to 50% using its virtual fitting solution. 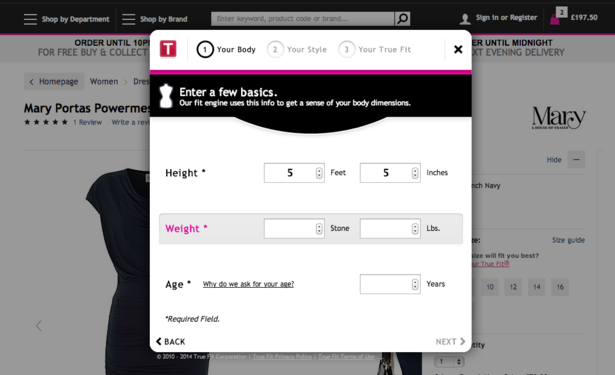 Called Virtusize, this tool allows customers to compare the specific measurements of an item they are looking to buy with an item they already own, displaying and overlaying 2D silhouettes of both garments so customers can more accurately compare sizes and choose the item that would fit them best. David Moth took the tool for a test-run (and also an excuse to expense some new threads) last year. David admits that he too buys several different garments safe in the knowledge that he’ll probably only keep one or two then post the others back free of charge. However he goes on to say that the tool inspires confidence during the buying process, particularly when comparing products against garments that you’ve previously bought from ASOS. From Virtusize’s point of view the beauty is that once a user uploads a garment to their account they can compare it against products on any site that uses the tool. So for example, when someone is shopping on ASOS they can compare the products against items they’ve previously bought from Stylebop. Therefore Virtusize becomes increasingly valuable and useful for the customer as more retailers come on board. US footwear retailer Running Warehouse has managed to reduce fit-related returns rates by 23% by introducing an app which allows customers to find more accurate information about the shoe size they need. Previously, around 65% of the retailer returns were due to size related issues, but now 20% of orders come in from customers that have used the app. The Shoefitr app uses a database of internal shoe measurements, acquired using 3D imaging technology, which allow it to compare the size and shape of a shoe a shopper is currently wearing, to one they want to buy. The results then recommend the best size, and the customer can then see more detail about the fit, and compare it with other sizes. UK department store House of Fraser has recently launched a sizing tool as part of its newly redesigned, touch-screen optimised site. More than half of its traffic comes from mobile devices, so it was necessary for House of Fraser to change its strategy to one that’s mobile-first. In doing so, it’s also had to find a solution for the potential increase in customer returns. It’s called True Fit. You fill in details of your size, weight, body shape etc, and this produces a recommendation for the size that is best suited to you. This size recommendation then appears on subsequent product pages. Sojeans has an excellent tool called Soselect that offers size profiling with personalised recommendations. Here in just four clicks, you can find the perfect pair of jeans for your shape and taste. A notoriously difficult thing to do, even when shopping on the high street. First you have the basic details to input. Then slightly more specific details, conveyed in easy to understand, down-to-Earth language. You can also include important details such as the type of shoes you wear (there are female alternatives to all these sections). You are then offered results with a percentage based result on how likely they’ll fit. This is a great tool for times when perhaps price is no object. For most customers however, the price of the 100% recommended pair of jeans may be too high. A less suitable pair may be in the right price-range, but then again if they don’t fit properly, what’s the point of using this tool? As Moth points out in his review, by providing free delivery and a free returns policy, as well as promoting this prominently on the site, Sojeans is doing what it can to overcome shoppers’ doubts and maximise conversion rates. A few weeks ago, I wrote an article emphasising the importance of customer data and insight to shaping a retail marketing strategy. Unfortunately, in my experience, key decisions are too often based on guesswork; following the latest fad, copying the competition or buying a solution that isn’t aligned to objectives and customer behaviour. This post is designed for those small businesses that aren’t yet selling online and are getting ready to start. I won’t pretend this piece is for those with lots of experience online. It’s more a starting point to steady the nerves for those that are bamboozled by how complex supplier selection can seem. Although many ecommerce ventures are small scale, and indeed many choose to stick with online marketplaces instead of going it alone, this doesn’t mean the effort involved is small. Even once a successful ecommerce website build is complete, your small business will rapidly find it has the need for extra resource to keep the beast purring.